"The federal government's proposed voluntary student unionism (VSU) legislation will effectively sound the death knell for university sport in Australia (along with just about every other service offered by student organisations). 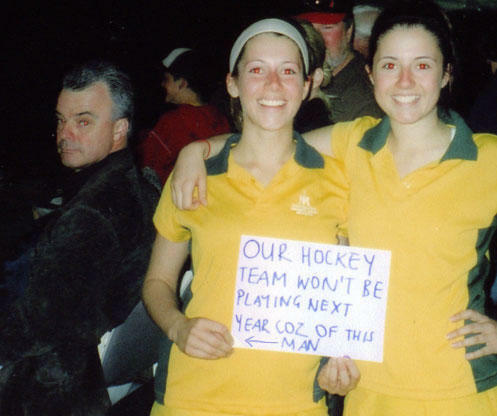 "On Sunday night, federal education minister Dr Brendan Nelson called in to the North Ryde Hockey field to watch his daughter play. "The match that had just ended featured Macquarie University and UTS. Hockey in particular will get hammered. The uni clubs (UTS, Mac, USyd and UNSW) are fairly big and cater for both junior and senior, men and women. That's a LOT of people who won't be able to play next year if they don't pony up the $700 rego fee. Yep, let's all pony up for a bunch of rich girls to play hockey...sheesh! Go troll her blog Shaba. Sport is a trickier matter, but the ANU student association managed to cut its spending on clubs & societies this year from $75,000 to $8,200 - all without increasing membership fees or real loss of services. Some people - those who knew how to squeeze every cent by applying for this and that grant to do X, Y, and Z - lost out big time. Everyone else noticed no change. University is about academics, not sporting clubs. If someone wants to play hockey, do it privately and outside the Uni. I’m glad my money isn’t going to rubbish like that anymore. Antony, that picture is a terrible example of why we should be handing money over to the Union. I love how having a different opinion = trolling around here. Heh. Diversity, indeed! Seriously, though, the question I've never seen answered is, if student unionism is so popular, and so many kids want to pony up the fees anyway, what's the problem with making it voluntary? Why the obsession with making things compulsory? bugger the hockey - save the Rowden White Library!